Families who lost relatives in the 9/11 attacks are reacting in anger to commercials for George W. Bush’s campaign for President. 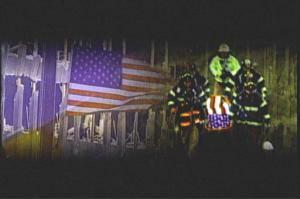 The ads show images of Ground Zero and fire fighters removing a body. "Families are enraged," said Bill Doyle, 57, of New York, who is active in several Sept. 11 family groups. "What I think is distasteful is that the president is trying to use 9/11 as a springboard for his re-election." "It's entirely wrong. He's had 3,500 deaths on his watch, including Iraq," said Doyle, whose 25-year-old son Joseph died at the trade center. 9/11 families are particularly upset over Bush’s reluctance to testify before the independent commission investigating the attacks. How upset are people? Ron Willett of Walnut Shade, Missouri, said he was disgusted when he saw the ads. Willett, who lost his 29-year-old son, John Charles, when planes hit the trade center, said he is now so upset, "I would vote for Saddam Hussein before I would vote for Bush." Among the families that have come forward are Republicans, Democrats and Independents, according to CNN. The fire fighters union has already endorsed John Kerry.